Coor-lee, coor-lee, coor-lee. The call was strident, one of fear; rather than the attractive bubbling trill so often heard echoing across New Forest heaths and mires. And with good reason, for nearby, a gaudily dressed group of people and a couple of energetic dogs were taking a short cut between well-used heathland paths. They were unaware of the bird’s distress, but meant no harm as they enjoyed a Sunday afternoon stroll in the countryside. Yes, it was spring again, and to the fore was the thorny issue of people and dog-related disturbance to New Forest ground nesting birds. Curlew, lapwing, snipe and redshank are the most vulnerable species, breeding birds that are in decline in much of lowland Britain. A survey undertaken by the RSPB in 2004 repeated similar work from 1994 – the details were reported in the Hampshire Bird Report, 2004. The results suggested a 34%-39% increase in lapwing numbers in surveyed areas; whilst snipe, curlew and redshank had declined by 29%, 25% and 22-26%, respectively. But when extrapolated to produce Forest-wide estimates, the changes were not found to be statistically significant, although to those not well-versed in statistics, they seemed substantial. 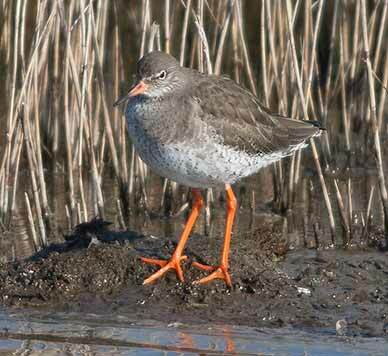 The accompanying report suggested that further studies might reveal long term trends in wader numbers and the effects of recreational pressure; and might help gain a better understanding of the changing conditions of the wetland habitats. So, the question remains. Does increasing pressure from people, and particularly their dogs, affect ground nesting birds’ breeding success and numbers? Well, common sense surely suggests a resounding ‘yes’, and there is scientific evidence to substantiate the assumption - relatively recent research in New South Wales found that numbers of birds in areas where people took their dogs for a walk fell by 41%, and that the number of species fell by 35%. Similar results were recorded in sites often frequented by dog-walkers and also those where the practice was prohibited, suggesting that the birds did not get used to the presence of dogs. Humans walking alone also caused disturbance, but on average less than half that caused by dog-walking; whilst two humans walking together without a dog had no more impact on the birds than a lone walker without a dog. The conclusion: birds respond uniquely to the presence of dogs. Yet almost inevitably, the findings were challenged by some, who disputed their UK relevance. And in many instances, they have a case, for a number of New Forest ground nesting birds – tight sitters like woodlarks and nightjars, for example – have in recent years prospered, whilst Dartford warblers - birds that often nest very close to the ground - have also done well. (Of course, all might have done even better without disturbance). The ever-wary waders, however, need space in which to breed, and that is a major problem here in the densely populated south of England, although the majority of casual visitors to the New Forest do little harm, for they often remain around the car parks, or play cricket and football on the lawns. So, what can be done about those who like to wander with their dog, enjoy the exercise that walking provides, and appreciate the sense of well-being that comes from visits to the countryside? Well, it’s tempting to conclude that they’re just the sort of people who are likely to be inherently sympathetic towards conservation if the message can be effectively communicated and regularly reinforced. The Forestry Commission and others have tried, with some success. Signs warning of the presence of ground nesting birds, for example, are displayed in many places, but have now, arguably, lost much of their early impact. A small number of more substantial, illustrated interpretation boards are also used, but the accompanying maps often seem largely unintelligible, even to people who know the areas well. There’s a clear and rather obvious case, then, for substantially improved signage. 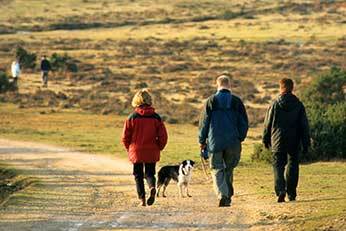 The New Forest Dog Owners Group (NFDOG) – membership impressively close to 3,000 - way back in 2001 produced an excellent, well-publicised dog walking code that is still circulated to new members. The key points: dogs that cannot otherwise be controlled should be kept on a lead, and only existing tracks should be used during the bird breeding season. Now, though, after 8 years, the code would benefit from strengthening, and the addition of an element encouraging people to use only main tracks. And the same applies to a similar code produced by the Forestry Commission. But even then, a more proactive approach, particularly in the most sensitive areas and at times of particular pressure, would surely help. How about the provision of a ranger or volunteer presence - people with display material to offer advice and explain the issues, leave information leaflets on parked cars, and be willing to tackle errant walkers and dog walkers. Manpower would, of course, be needed, but if Montagu’s harriers can be wardened, and the RSPB’s Aren’t Birds Brilliant show staffed, why not an initiative to help protect breeding waders, particularly if the dog walking fraternity as well as conservationists were enlisted to help? Perhaps – and let’s hope for progress –the New Forest National Park Authority (NFNPA) Recreation Management Strategy will provide answers and proposals to which all interested parties can sign-up. The draft included elements intended to promote responsible dog walking; and introduced for discussion the spectre of seasonal car park closures in sensitive areas, and dog free car parks. Predictably, local outcry followed amid fears that dogs were to be banned from the New Forest, or at the very least, allowed only if on a lead. And of course, car park closures would affect other users – a great many birders would presumably be less than impressed if easy access was removed from, say, the Shatterford and Pig Bush areas. (Potential loss of access might, though, encourage volunteer wardens to come forward). Prolonged consultation has been undertaken by the NFNPA, to which many HOS members no doubt contributed. (Saira Evans, Recreation Officer with the NFNPA advised that 460 individual consultation responses were received, in addition to over 1,000 ‘template’ responses from NFDOG members). Further ‘second tier’ consultation has also been completed, which included a series of workshops to which NFDOG and other recreational and conservation organisations were invited. We all now wait with baited breath for sensible solutions to this problem. In the meantime, let’s hope that subsequent ground nesting birds’ breeding seasons are a success, and that all those who walk in the New Forest enjoy the experience.